Protecting hoses from intense heat, flames and molten metal splash, bundling of wires, protecting personnel from hot pipes. Induction Melting Repairs are an authorized/preferred distributor for ADL Insulflex range of thermal protective sleevings and blankets including FireSleeve, Pyrojacket, Pyreflect Sleeve, Flexguard Sleeve, and PyroBlanket. Primarily used for fabrication of valve insulation covers, and hanging flame protective blankets in outdoor and offshore applications. A lightweight (17oz/yd2; 578g/m2), high temperature resistant fabric, designed to shed weld spatter and resist high heat and occasional flame. It is constructed from a glass fibre base fabric, impregnated both sides with a tough, specially compounded silicone rubber coating. Withstands all types of contaminants. Completely impervious to water, moisture, hydraulic oils. Normally available in iron oxide red, or silver. Other colours available by special order. 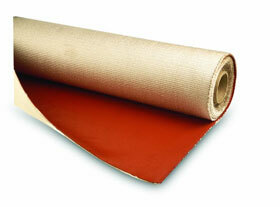 ADL Insulflex Pyroblanket™ 17oz is sold in rolls 60" (1525mm) wide by 150' (45m) long. 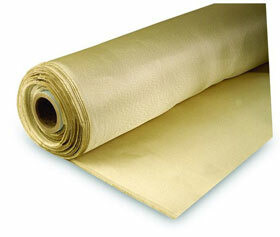 It can also be supplied in cut lengths, custom shapes, or as fabricated curtains with grommets. A midweight (32oz/yd2; 1085g/m2) high temperature resistant fabric, constructed from a glass fibre base fabric, impregnated both sides with a specially compounded silicone rubber coating designed to shed heavy weld spatter and resist heat and occasional flame. Available in iron oxide red. Other colours available by special order. 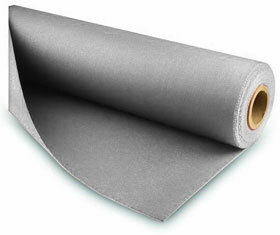 Pyroblanket™ 32 oz is sold in 60" and 36" widths (1525 mm and 915 mm) x 150 ft (45 m) rolls. It can also be supplied in cut lengths, custom shapes, or as custom fabricated curtains with grommets. Ultra-heavy grade, high temperature resistant fabric, designed for use in severe molten splash applications in the primary metals industry. Our heavyweight Pyroblanket™ 96 oz (3260g/m2) is constructed from a glass fibre base fabric, coated one side only with a very thick layer of specially compounded silicone rubber that sheds molten splash almost instantly, before heat transfer can occur. It is used primarily for fabrication of specialized covers and curtains in applications such as electric arc furnace (EAF), blast furnace and casting, where severe molten splash occurs. It can be cut and sewn into custom shapes and formats, or used with other high temperature fabrics in the range to create unique protection products for the most severe industrial applications. The silicone rubber coating is completely impervious to water, moisture, hydraulic oils. When exposed to high temperatures or molten splash for extended periods, the coating transforms into a silica refractory crust. 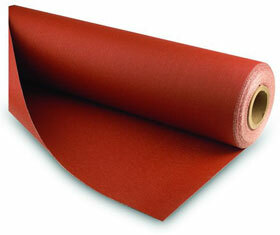 Pyroblanket™ 96 oz is sold in 40" (1016 mm) x 150 ft (45 m) rolls. It can be supplied in short cut lengths, customs shapes, or as fabricated curtains with grommets. Available in standard sizes or custom fabricated into almost any shape or supplied in curtain format with factory installed grommets to your specifications. Suitable for use at 982°C, and able to withstand short term exposure up to 1650°C, Silicaflex woven Silica textile blanket is constructed from a 96% pure SiO2 Silica fibre - a health conscious alternative to asbestos and ceramic textiles. Silicaflex blankets set the standard for flexibility and minimum lineal shrinkage under high heat conditions. Durability is further enhanced with a hydrocarbon coating, giving Silicaflex blankets unmatched abrasion resistance and tensile strength. 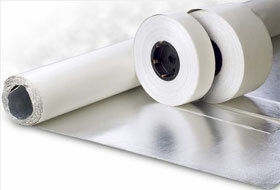 Available in thicknesses of 0.76mm and 1.27mm. Standard 915mm width. Sold in 45mtr rolls, or supplied in custom lengths. Also available with an adhesive backing or with an aluminium foil reflective coating. Performance lab tested at 1650°C for 1 minute, Pyreflect™ fire blanket reflects at least 90% of radiant heat energy. An ideal choice for operations where radiant (infrared) heat flow must be blocked or stopped. The mirror-like surface of Pyreflect™ reflects heat away, instead of of absorbing heat and dissipating it through the fabric. ADL Insulflex Pyreflect™ heat reflective blanket is fabricated from two layers of Aluminium coating and a protective film, all laminated by means of a heat stable adhesive to a specially designed heavy grade aramid (Nomex/Kevlar) fibre cloth. The aluminium layers will not delaminate from the cloth, even under the most extreme heat conditions. Nomex® and kevlar® are registered trademarks of Dupont. Pyreflect™ Blanket has extremely durable construction, and can meet the most demanding abrasion and tensile strength requirements. 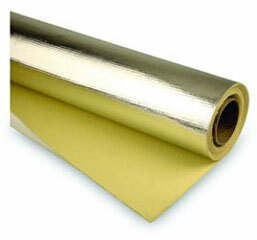 Pyreflect™ Blanket is sold in rolls 1016mm wide. It can also be custom fabricated into almost any shape, complete with closures or factory installed grommets to meet your specifications. Ideal for radiant heat applications requiring high adhesion, abrasion protection, and a surface impervious to fluids and contaminants. Fibreflect™ is a heat refelctive flexible sheet, constructed from a thin layer of aluminium foil which is heat stable laminated to a texturized glass fibre base fabric on one side, with a pressure sensitive adhesive on the other to facilitate installation. The durable construction of Fibreflect™ Blanket is suitable for demanding applications up to 204°C continuous operating temperature. The glass fibre base fabric will stay intact up to 538°C. Fibreflect™ Blanket is supplied in standard 45m rolls x 1525mm wide, and custom lengths and shapes.